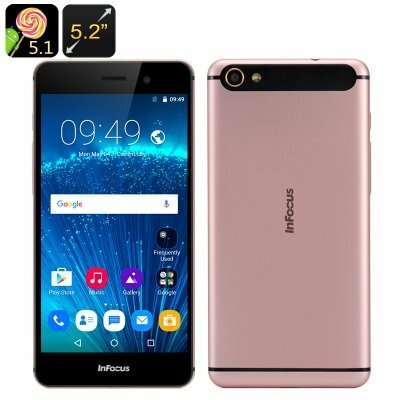 Successfully Added InFocus I808 Android 5.1 Smartphone - 5.2 Inch FHD Screen, 4G, Octa Core CPU, 2GB RAM, 32GB Memory +128GB SD Slot (RoseGold) to your Shopping Cart. Packing a 13-megapixel primary camera and 5MP front shooter for selfies. With a reputation rose gold finish and 32GB of storage with option to expand that by 128GB the InFocus I808 is enough to make any iPhone user livid, as it brings top of the range specs and styling's for a little over $100. What's not to love about that. A 5.2 inch FHD display with great color depth and pin point sharp images will make playing games or viewing films a really enjoyable experience. Add to that the octa core CPU, Mali-T720 GPU and 2GB of RAM you will enjoy a seamless experience with the InFocus I808. Having 2 Nano SIM slots this stylish smart phone brings market leading connectivity allowing Dual SIM dual standby so you can receive business or personal calls on the same device and organize all your contacts with total ease. Each SIM slot offer support across a wide range of cellular frequencies including 2G: GSM 850/900/1800/1900MHz, 3G: WCDMA 850/900/1900/2100MHz, TD-SCDMA:B34/B39; 4G: B1/B3/B7/B8/B28; and B38/B39/B40/B41 so you will get a signal in most countries around the world. An Android 5.1 OS brings the joys of voice commands and streamlined features making a more intuitive interface for all your apps, games and media. with its responsive 10 point touch screen the I808 is quick to respond to all your requests and boasts a 13 MP primary camera as well as a 5MP front shooter for all those selifes. InFocus I808 Smart phone packs all these features and more into one affordable package that comes with a 12 month warranty, brought to you by the leader in electronic devices as well as wholesale Android Smartphones..